Elin's THIRD Instructional DVD is OUT! PLEIN AIR PAINTING with an ATTITUDE! DVD is now available! $24.95 plus $4.75 shipping/handling First Class Mail! 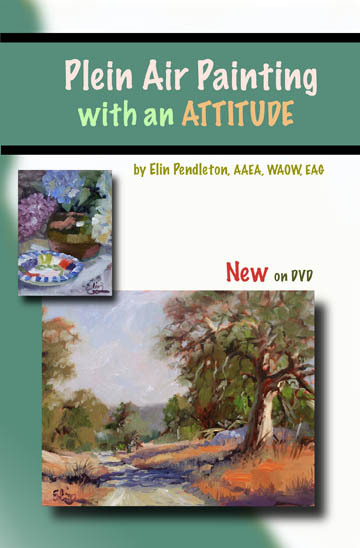 Elin Pendleton's new DVD reissue of the original VHS has been completed in response to the enormous success of her first two videos, " Oil Painting with an ATTITUDE " and "Acrylic Painting with an ATTITUDE". As in the first videos, Elin's upbeat message will show you how her positive attitude takes the "pain" out of "pain"ting! A Special Section where Elin uses her Pack Goats for a morning of painting! Go to comments by people who have purchased Elin's DVD (below). Elin doesn two paintings on location in this video, one of a landscape, and a second one of a still life set up just outside the door of her studio. Elin's methods of painting on location are fast and easy! Are you ready to leave your studio and go out and paint from nature? Do you want to do it and enjoy your experience? In this DVD, Elin Pendleton will show you how her upbeat attitude combined with her timesaving techniques make painting on location an enjoyable experience. Having taught for two decades and being a professional artist for even longer, Elin will show you how she and others go outdoors with their media. $24.95 plus $4.75 shipping via First Class Mail! Using the idea that painting on location should be funnot frustratingElin shows you the supplies and on-location tips to create not one, but two, oil paintings quickly and easily. 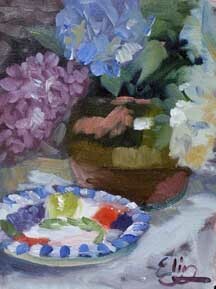 She outlines supplies for all media, and uses her oils for the demonstrations. She takes you through the painting sessions with her philosophy that "if it isn't simple, it can't be fun". Her credentials as an artist are impressive. Elin holds memberships in the Women Artists of the West, Oil Painters of America, the National Acrylic Painters Association, and the American Academy of Equine Art. Elin's techniques have been featured in major art magazines. Her web sites at elinart.com and dailypaintings.com are filled with her work, including her most recent paintings, with information about her upcoming demonstrations and workshops. 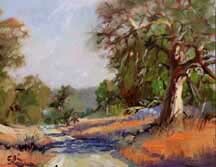 This DVD is a definite "must have" for both beginning and experienced plein air painters. One hour in two demonstrations. Margi Brom, June: "Just wanted you to let you know I received "Plein Air Painting with an Attitude" and the postcard... thank you so much! I have contacted and received a catalogue of paints from Triangle Coatings and plan to order the basic six colors plus white, thanks to you! The video is most informative, and I shall watch it many times." From Nita Leland, author of several books from North Light and nationally recognized workshop presenter: I finally had the leisure yesterday afternoon to sit down and watch your video. Wonderful! You present your material so well and it was just amazing to see how quickly you put the whole painting together from start to finish. You made me want to switch to oils! It was very well done. I did enjoy it, and I'll be honest with you, I usually glaze over after a few minutes of most demos. Yours held my attention from beginning to end. Congratulations!